This image is a page from the book: The Fairmount Parkway : a pictorial record of development from its first incorporation in the city plan in 1904 to the completion of the main drive from City Hall to Fairmount Park in 1919 ... / Fairmount Park Art Association. Philadelphia, 1919. 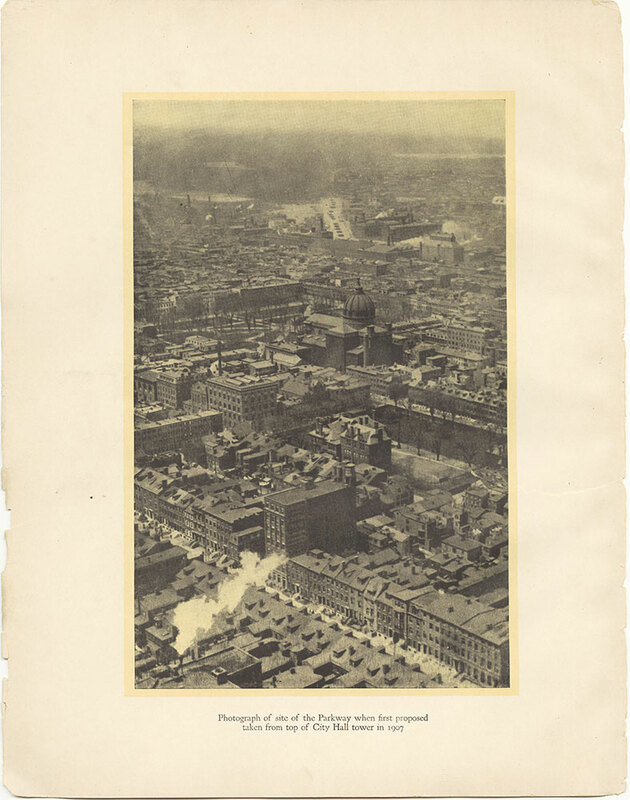 The photograph is a 1907 aerial view of the proposed Parkway site, taken from the top of City Hall. One of the most significant buildings that would be spared by the construction is the Cathedral Basilica of SS Peter & Paul, its prominent dome easily seen highlighting the urban landscape. To see the same view in 1919, well into the construction of the Parkway, see item #pdcp01057.